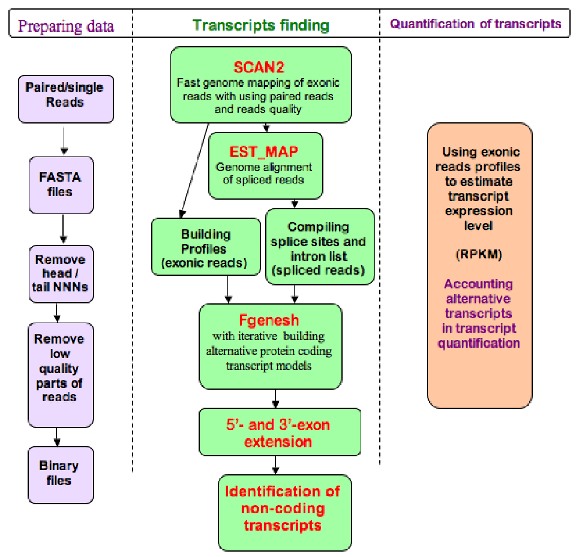 Transomics - pipeline to map RNAseq data, assemble them into transcripts and quantify the abundance of these transcripts in particular datasets. The pipeline will include the following key components: ReadsMap tools for alignment of RNA-Seq reads to genome, Fgenesh++R identification of alternative transcripts gene prediction tolls, and ExpLevel tool for measuring expression levels of predicted transcript isoforms. We build the gene identification with RNA-Seq data based on components of FGENESH++ gene finding pipeline (Salamov, Solovyev, 2000; Solovyev et al., 2006; Solovyev, 2007), which is known as one of the most a ccurate eukaryotic gene identification tool and has been used in annotation of a dozen new genomes. The general scheme of Transomics pipeline. 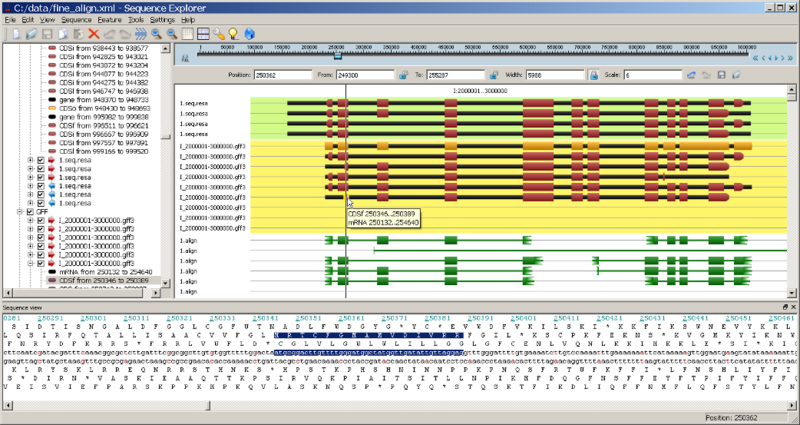 ReadsMap provide information on splice sites and intron positions that forces modified version of Fgenesh++ to produce gene models that are supported by RNASeq data. Fgenesh++R provides possibility to predict tissue specific gene variant or even produce alternatively spliced gene models. These models can be visualized in the ReadsMap Viewer. Alternative gene models predicted by Fgenesh++R pipeline. 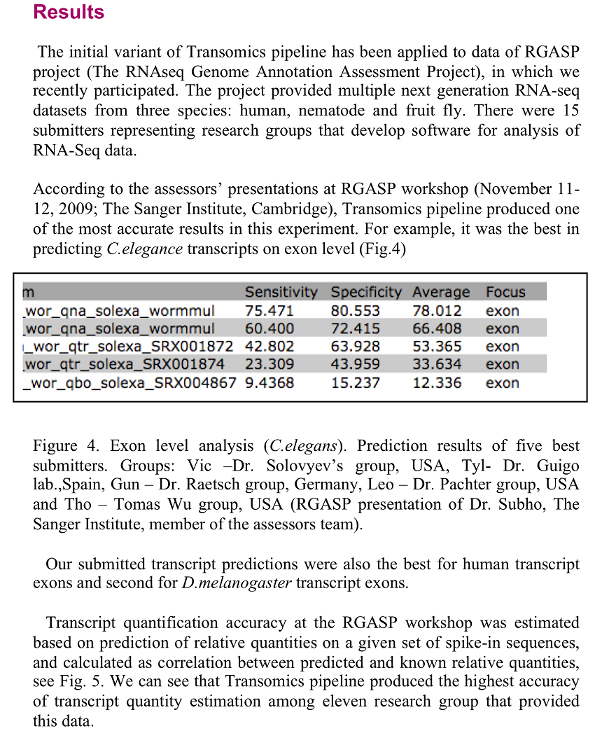 Finally, Transomics pipeline includes a module to compute a relative abundance (expression level) of alternative transcripts generated from the same gene locus using a solution of a system of linear equations. 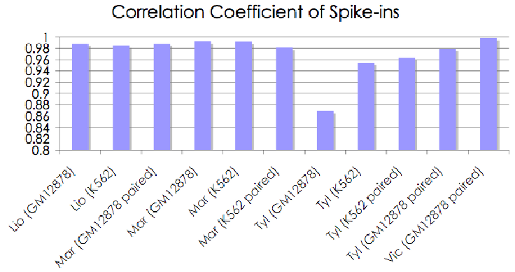 Relative accuracy of spike-in transcript quantification submitted by 11 participants of the RGASP assessment experiment (presented at the workshop by as in Figue below., our group is the rightmost one. Dr. Kokocinski, The Sanger Institute, Cambridge, member of the assessor's group). The group names are the same.